[Pascal] Saint-Amans [head of the OECD's tax division] suggested the TJN estimates might be overstated. "I was wondering where the equivalent of 450 Bill Gates are hiding from everyone. It looks like the equivalent 20,000 unknown billionaires in the world or 200,000 people with net worth of 100 million," he said. 1. [Tier One:] “Oligarch/ politburo/ dictator/ oil sheiks class: Top 100 in the world: 40% of their $4.2 trillion of total financial wealth offshore: average total financial wealth is $42 billion. 2. Tier two: “ordinary billionaires: ” 2900 in the world: 33% of their $4.33 trillion of total financial wealth is offshore, with an average of $1.5 billion each. 3. Tier three: “ultra high net worth:” 117000 that keep 25% of their $6.8 trillion of total wealth offshore, with an average of $58.1 million each. Murphy adds " that this much wealth is offshore is not just plausible – it only requires us to make modest assumptions about the proportions of various known types of portfolio that actually exist to think that such level of offshore holding is likely." He acknowledges in the comments that of course any attempted measure of that which is completely hidden can be nothing more than an estimate. Of course, governments and banks around the world certainly have the info, and confirmation could be obtained if disclosure was compelled. But the OECD has not taken the high road on this. Instead it has supported the veneer of transparency over the systemic support of an international architecture of obscurity. When we say offshore centers, when we say secrecy jurisdictions, when we talk about banking secrecy, people may think that these are alien lands, in no-man lands, but actually you will be surprised to know, if you didn’t know—I’m sure you know, but for those who didn’t know, they will be surprised to hear that the biggest offshore centers are in countries like the U.K., in London, the U.S., in New York, Paris in France. These are the biggest offshore centers where you find banks colluding with corrupt leaders, corrupt private investors, in hiding and not disclosing their investments and their bank accounts, because some of it was acquired illegally, was transferred illegally, is held illegally in the sense that it’s not reported to the government. From flowing data. Something really is wrong with this picture. 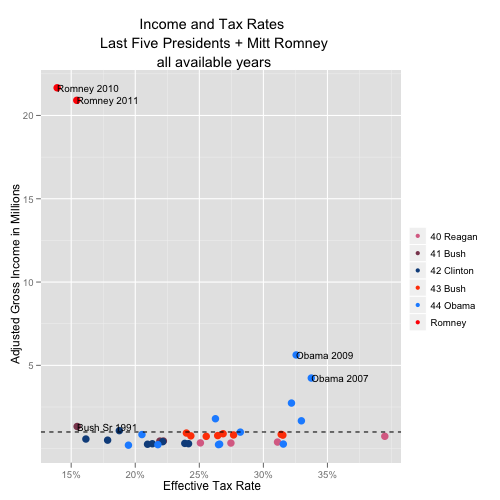 No wonder then that Romney prefers to keep all of his tax info to himself. Look at Reagan, all the way over to the right by himself. Labels: tax culture, tax policy, u.s.
McDonald's and Coke won't take corporate tax breaks offered by the UK in connection with the Olympics, after an NGO campaign entitled "Stop the Olympic Tax Dodging." It's not strictly speaking "tax dodging" to take advantage of an exemption expressly granted by law, but this particular exemption has generated a lot of protest as a wholly unnecessary giveaway on the part of the UK. Indeed, it is an unnecessary and wasteful giveaway, as sponsorship in the Olympics (aka the World's Longest Commercial Break) is such a hot commodity. This is from Planet Money and Adam Davidson has a related column. Notice that "It's all legal," so this is not about evasion. Really! It's about protecting your assets from a greedy spouse or undeserving creditors (or is it the other way around). Of course it's not about evasion. It's about the ability to say of your investments, "I don't manage them. I don't even know where they are." That is completely disingenuous. Cheating is not about not overly complex regulations. It is purely and simply about a desire and willingness to cheat plus an ability to get away with it. Once again, I have to quote Charlie Kingson: When a large corporation says it wants simplicity, it wants money." The Great American Jobs Act Caper, 58 Tax Law Rev. 327 (2005). Tim W-thanks for the link. Labels: evasion, offshore, Tax law, u.s. This story reports that in resorts on a number of the Greek islands including Crete, the rate of tax evasion is 100% or nearly so. I'm not sure it's properly called evasion if there is apparently zero enforcement. That's not a bug, that's the system? 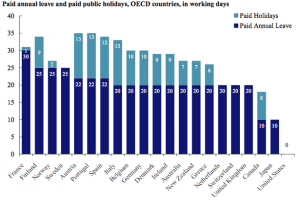 [W]orkers in the United States are less likely to receive paid annual leave and paid public holidays, and those U.S. workers that do receive paid time off generally receive far less than their counterparts in comparable economies. ... The United States is the only advanced economy in the world that does not guarantee its workers paid leave. ...In all countries many employers offer, usually as a result of collective agreements, public holiday entitlements over and above statutory minima. ... in the United States, almost one in four workers there has no paid leave and no paid public holidays at all. ...lower wage workers are less likely to have any paid leave (69%) than higher-wage workers (88%); part-timers (36%) far less likely to have paid leave than full-timers (90%); and workers in small establishments (70%) are less likely to have paid leave than those in medium and large establishments (86%). Parramore recalls the 60s, when unions and progressive national policies tempered repression in the workplace, but as we know most of that came to a screeching halt with the Reagan election. Three decades later plenty of Americans who have suffered the stagnant wages and stripped benefits that characterize life in the contemporary American workforce continue to support the policies and politicians that ensure and increase their submission, while reviling both unions and federal regulatory policy as assaults on freedom. That is perplexing. Airlines will not have to pay for the permits until next year, and are pressing their governments to agree on a global deal before then. Russ Bailey, a senior attorney for the Air Line Pilots Association, a U.S. lobby group, said time is running out for EU ETS opponents to come up with a viable alternative. "There is a sense of urgency because airlines have to start paying next April. We hope there will be a resolution that becomes clear enough before then," he told Reuters Point Carbon." I doubt that Bailey has in mind a resolution that every country will adopt the EU system, even though that would be crystal clear as far as resolutions go. The global deal sought here is reversion to the status quo, of that there can be little doubt. For US persons living abroad, living their lives means having foreign bank accounts. Regimes like FATCA and FBAR are particularly harsh for these persons, many or perhaps most of whom are either dual citizens themselves or are in families with dual and multiple citizenships. While it seems clear to me that the US can impose its sovereign jurisdiction with regimes like FATCA and FBAR, it's less clear to me that it should do so, especially with a one-size-fits-all approach that appears to treat everyone with a foreign bank account as a potential tax criminal. The question is whether and how these regimes can be tamed so that they fulfill the core mission--catching tax cheats--without becoming a Team America: World Tax Police, bypassing bilateral and multilateral cooperation among governments in order to impose draconian US rules on individuals and financial institutions across the globe. the U.S. diplomatic relations department, or, worse, they are signaling a loss of faith in the pursuit of cooperation through diplomacy. I suggest that carving out an exception for US persons who are using bank accounts to live their lives as residents and often dual citizens abroad could provide a means of backing away from either of these destructive positions. Labels: FATCA, globalization, international law, sovereignty, u.s.